In manufacturing, ongoing maintenance of production line machinery and equipment represents a major expense, having a crucial impact on the bottom line of any asset-reliant production operation. Moreover, studies show that unplanned downtime costs manufacturers an estimated $50 billion annually, and that asset failure is the cause of 42 percent of this unplanned downtime. For this reason, predictive maintenance has become a must-have solution for manufacturers who have much to gain from being able to predict the next failure of a part, machine or system. Predictive maintenance uses advanced AI algorithms in the form of machine learning and artificial neural networks to formulate predictions regarding asset malfunction. This allows for drastic reductions in costly unplanned downtime, as well as for extending the Remaining Useful Life (RUL) of production machines and equipment. In cases where maintenance is unavoidable, technicians are briefed ahead of time on which components need inspection and which tools and methods to use, resulting in very focused repairs that are scheduled in advance. Because of today’s very short time-to-market deadlines and a rise in the complexity of products, manufacturing companies are finding it increasingly harder to maintain high levels of quality and to comply with quality regulations and standards. On the other hand, customers have come to expect faultless products, pushing manufacturers to up their quality game while understanding the damage that high defect rates and product recalls can do to a company and its brand. Quality 4.0 involves the use of AI algorithms to notify manufacturing teams of emerging production faults that are likely to cause product quality issues. Faults can include deviations from recipes, subtle abnormalities in machine behavior, change in raw materials, and more. By tending to these issues early on, a high level of quality can be maintained. Additionally, Quality 4.0 enables manufacturers to collect data about the use and performance of their products in the field. This information can be powerful to product development teams in making both strategic and tactical engineering decisions. The International Federation of Robotics predicts that by the end of 2018 there will be more than 1.3 million industrial robots at work in factories all over the world. In theory, as more and more jobs are taken over by robots, workers will be trained for more advanced positions in design, maintenance, and programming. In this interim phase, human-robot collaboration will have to be efficient and safe as more industrial robots enter the production floor alongside human workers. 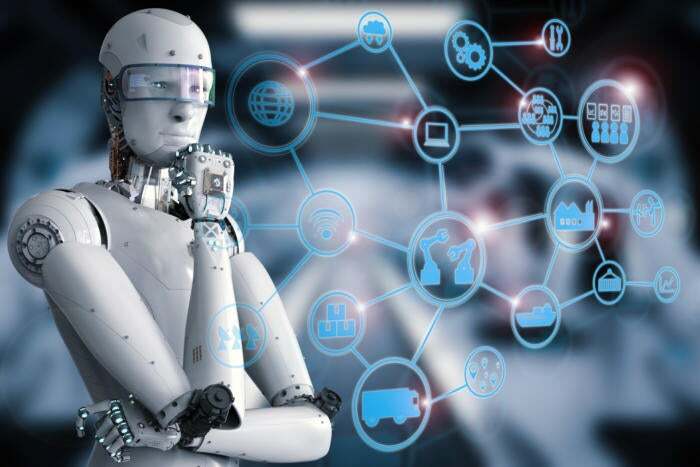 Advances in AI will be central to this development, enabling robots to handle more cognitive tasks and make autonomous decisions based on real-time environmental data, further optimizing processes. Artificial intelligence is also changing the way we design products. One method is to enter a detailed brief defined by designers and engineers as input into an AI algorithm (in this case referred to as “generative design software”). The brief can include data describing restrictions and various parameters such as material types, available production methods, budget limitations and time constraints. The algorithm explores every possible configuration, before homing in on a set of the best solutions. The proposed solutions can then be tested using machine learning, offering additional insight as to which designs work best. The process can be repeated until an optimal design solution is reached. One of the major advantages of this approach is that an AI algorithm is completely objective – it doesn’t default to what a human designer would regard as a “logical” starting point. No assumptions are taken at face value and everything is tested according to actual performance against a wide range of manufacturing scenarios and conditions. Artificial intelligence is a core element of the Industry 4.0 revolution and is not limited to use cases from the production floor. AI algorithms can also be used to optimize manufacturing supply chains, helping companies anticipate market changes. This gives management a huge advantage, moving from a reactionary/response mindset, to a strategic one. AI algorithms formulate estimations of market demands by looking for patterns linking location, socioeconomic and macroeconomic factors, weather patterns, political status, consumer behavior and more. This information is invaluable to manufacturers as it allows them to optimize staffing, inventory control, energy consumption and the supply of raw materials. The manufacturing sector is a perfect fit for the application of artificial intelligence. Even though the Industry 4.0 revolution is still in its early stages, we’re already witnessing significant benefits from AI. From the design process and production floor, to the supply chain and administration, AI is destined to change the way we manufacture products and process materials forever.